For your liquid storage needs. Constructed from plastic, our carboys are thick and durable, to ensure rigidity and safety during operations. They are free of Plasticizers, BPA and DEHP and impermeable to oxygen. Our plastic carboys are primarily used for transporting liquids, often water or chemicals. 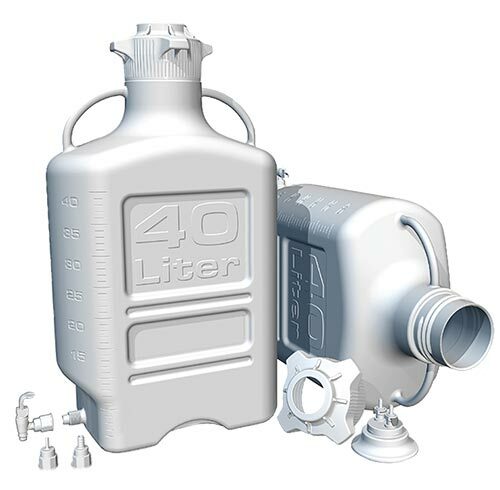 In modern laboratories, our carboys are used to store large quantities of liquids, such as solvents or deionised water, and include a tap for dispensing. Our plastic carboys are also used to collect and store waste solvents, and is preferable to using glass with a lesser chance of breakage. For Food and Beverage use, carboys are used during brewing for fermenting beverages such as wine, mead, cider, perry, and beer. Our Carboys are fitted with FlexiCap technology to prevent bacteria and oxygen from entering during the fermentation process. All of our carboys have a hydrophobic coating on the inside surface offering optimum efficiency for your process, making it difficult for odours, flavours and colours form adhering to the inside walls. This also allows for longer lifecycle of your carboy. Carboys can be fitted with a number of specifically designed attachments made out of a similar excellent grade plastic. Need more information about Carboys? At SPS Canada, we can fit you with the best products at the best prices.